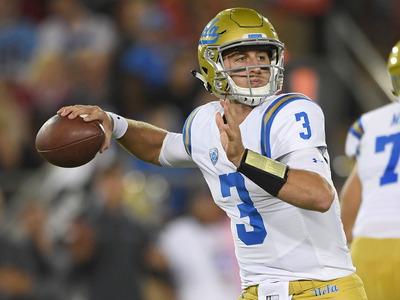 UCLA quarterback Josh Rosen reportedly is hesitant about declaring for the draft for fear of being drafted by the Cleveland Browns. Rosen is one of the top quarterback prospects in college football, and now that the Browns have officially secured the first overall pick, there’s nothing stopping them from drafting Rosen should he decide to enter the NFL. There’s a possibility that Rosen could refuse to play for the Browns and move to another team in a situation similar to the one that brought Eli Manning to the Giants in 2004. UCLA quarterback Josh Rosen is one of the most highly-touted quarterback prospects in college football, but there’s reportedly a chance that he skips out on the draft this year in order to avoid going to the Cleveland Browns. According to ESPN’s Adam Schefter, sources familiar with the situation claim that Rosen would prefer to play for the New York Giants over the Browns, and would be hesitant to declare for the NFL draft if he knew that he would be heading to Cleveland with the first overall pick. Rosen has not yet officially declared for the draft, and has said he plans to have a long conversation with his parents about the matter after the UCLA Bruins play in the Cactus Bowl. With their loss to the Bears on Sunday, the Browns officially secured the first overall pick in the 2018 NFL draft, so if they have their heart set on Rosen and he enters the draft, they will have the opportunity to pick him. That said, just because the Browns pick Rosen doesn’t necessarily mean that he’ll start the 2018 season in Cleveland. Quite possibly, the situation could shake out in a similar manner as the 2004 draft, when Eli Manning refused to sign with the San Diego Chargers after being drafted by them and finagled his way to the Giants where he played for his entire career.